Have I mentioned yet how much I love the festivals in Germany? There's always something to celebrate: the spring, the fall, the summer, beer, wine, food, culture, Christmas, Fasching...the list goes on. 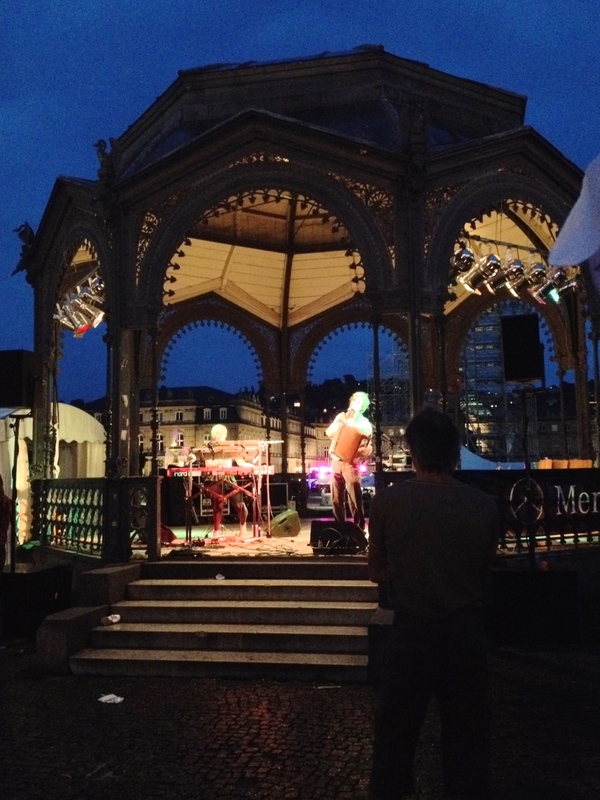 This past weekend was a celebration of summer at the Sommerfest in downtown Stuttgart in the Schlossplatz. This is the third year we've gone, and we've enjoyed the festival each time. The celebration is a chance for all the caterers in the area to pitch up make-shift restaurants, cocktail bars, and food stands to show off their wares while local bands play on various stages. The atmosphere is very relaxed with various kinds of food and shows geared towards all age-levels. You'll notice that I haven't attached any catering company names to the food. It seemed a bit silly in most cases to keep track, since in all likelihood these are food companies that you won't be able to visit on your own outside of the festival, apart from some of the sit-down restaurants, which we didn't try. And here's the point of difference in the food: While much of the food at the Sommerfest is sold at various stands where you order and go (this is especially true of the places in front of the Neues Schloss) several establishments set up their own sit-down location where you can only order full meals (we found this to be the case around the lake in the Schlossgarten in front of the Opernhaus). Personally, I prefer the food stands at occasions like this because then I can try more kinds of food. This year seemed a little different from the past two years for two reasons. First, there seemed to be more sit-down locations than I remember, though this may have been due to our choice to sit on the Opernhaus side instead of in front of the Neues Schloss as we did the past two years. Second, there wasn't as much of a crowd as I would have expected on the Sunday night we were there. Part of the reason why we took Leo and a blanket is because it gets to be too much to walk through the crowd with a dog when it starts to thicken around 6 pm or so. On Sunday, the Sommerfest was busy, but not crowded. This could, I suppose, be due to the fact that we were there on the last night and on a Sunday this year (as you'll recall, we were in Frankfurt over the weekend), or perhaps because it was threatening to rain that evening. The band was made up of a thin, blond-haired girl who played the keyboard while her bandmate, a tall, skinny man, played the guitar and the accordion. I think accordions are a rather underrated instrument, and it was neat to hear him mixing the sound with the keyboard and synth. In the next song, they started singing and recording their voices on a loop track so that they could harmonize. The music was so upbeat that a couple started to dancing in front of the gazebo, joined by another girl, and then another man, until it appeared that this whole family of travelers were dancing to the music and smoking cigarettes. I say travelers because the style of dancing and the beautiful way the women moved their hands while the men jumped from one foot to the next reminded me of a Middle-Eastern style dance. My suspicions that they were travelers (or maybe expats, like us) was confirmed when one of the men took his cigarette from his mouth while still dancing and shouted, "I love you Germany!" to everyone and no one in particular. The square was lit up from the festival, the band was really getting into the music, and people were clapping and laughing at the happiness and goodwill in the atmosphere. It was one of those rare, perfect moments that remind me that life is beautiful. Sadly, the moment didn't last as the clouds finally burst open and the rain drove us underground to the u-bahn station. Even the people with umbrellas were finding it hard to stay as the wind hurled the rain sideways, though the family of dancers continued on as long as, I suppose, Cato Janko continued playing. The festival is over for this year, but definitely keep a lookout for it next summer. The Stuttgart Sommerfest takes place every August for four days sometime in the middle of the month. The food stands and program of events usually begin around lunchtime and last until late in the evening, making it a great event for the whole family.